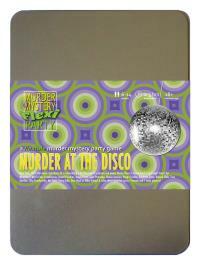 You've been invited to play the role of DELPHINE DISCO in Murder at the Disco. New York, 1977. Hot nightclub Disco 54 is hosting a birthday and only the coolest people are there. But before anyone can 'get down on it', nightclub owner Doctor Disco is found dead in the VIP lounge! Join us to find out whodunit! As a former model, you always look perfect. You wear an elegant jumpsuit with a plunging neckline and a striking pendant to draw the eye. Your stunning hair is tied with a patterned scarf and your platforms are the tallest. You are French and stunningly beautiful which immediately makes you better than anyone else, which of course you know. You were once a catwalk model, until you succumbed to the dubious charms of Doctor Disco. Now you are nothing more than a trophy wife, and a bored one at that. Still, there is always shopping. ‘Allo, I am Delphine Disco. I used to be a model but now I am the wife of Doctor Disco. Well, I was. Now I am his widow. It is no secret my ‘usband and I had little time for each other. We have not made love for many months - at least, not with each other. But I am still very shocked and sad about his murder. I will need some time to grieve...and another bottle of vin.